Listen to enough music in a lifetime and there will be those very occasional new projects that instantly trigger old memories. You're transported to another time when a new collection of music was first delivered to your ears that made a long lasting impression. 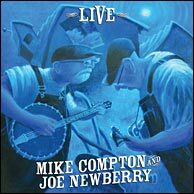 That was my experience with the first listen of Mike Compton & Joe Newberry Live, a recording with plenty of activity on stage leaving no doubt it was recorded before a live audience. This simple recording — two musicians, two instruments and two voices — captures the essence of how great music can be. Doc and Merle Watson at the Walnut Valley Festival, that first listen to Norman Blake's Live at McCabes, a brand new David Grisman Quintet in concert at Liberty Hall in Lawrence, Kansas in the late 70s, and the Stephane Grappelli quartet outdoors on an impossibly hot summer evening in Kansas City. That's the feeling I get from this recording, that precise moment when you know you're hearing a really special musical combination for the first time. My musical library has good new company, indeed. NOTE: due to a last minute change in the release date for the recording we did not have the opportunity to get Joe Newberry's input for the interview. Our apology! Listen to Fly Away My Pretty Lil' Miss from the recording. Mandolin Cafe: Your new recording with Joe Newberry (banjo, guitar, vocals) entitled Compton & Newberry Live is being released next week. We've talked to several other reviewers granted early copies and everyone is raving about it. Tell us how the recording came about and where it was made. Mike Compton: The "Live" recording is a product of a number of things that came together, but basically it was a matter of getting off our backsides and following through. Once our duet show had begun to pay off musically, Joe and I talked some about recording a few of our concerts and seeing if we could get a few takes from here and there to use for a live compilation album. So we began compiling a few sets to choose from. The recording that we ended up using was pulled from two sets that Joe and I did for the Brandywine Friends of Oldtime Music up in Newark, Delaware. I will have to say that if my partner Heidi Herzog had not kept after me and Joe and taken so much initiative to keep a fire lit under us, this project would probably have been a long time coming. Mandolin Cafe: Joe mainly plays guitar and sings on the recording but his frailing banjo playing is fierce. The combination of frailing banjo and hard driving Monroe style mandolin (and mandola) on the instrumentals make for a remarkable combination rarely heard. What are the qualities in his music and personality that attracted you to working with him? Mike Compton: I first became acquainted with Joe through one of my webcam students and good friend Val Mindel. She and Joe have taught many vocal workshops together over the years and she recommended me to Joe for the oldtime week at Augusta. Joe usually is in the lead seat over there for oldtime week and was needing a mandolin instructor. So we became acquainted through email. Over the course of our ironing out the instructor's contract he mentioned that he had an upcoming gig in NC and needed a partner to work it. I told him I had the weekend open and went over and we plowed through it. What I hear in Joe's playing is not only expertise in the genre, but a deep appreciation, a love of simple songs with a no-nonsense message, usually something pertaining to positive themes and down to earth people. Those are qualities I can get behind. Mandolin Cafe: We can never get enough of your rendering of DeFord Bailey's Evening Prayer Blues, a tune associated with Bill Monroe. Share with us the story of the song and particularly your arrangement. Mike Compton: Well thanks. DeFord said that the song illustrates a gospel choir and the voices intermingling with each other in praise. If you listen it doesn't take too much imagination to hear the different voices that make up the parts in a choir doing just that. Of course, following Bill Monroe's work all these years has yielded a number of versions of the song both live and in the studio that are remarkable to listen to, but once I heard Monroe say that he got it from Bailey, I had to find that version and see what it sounded like. There are two versions by DeFord but the one I've listened to and have a go at emulating is the first one recorded back in 1927. My arrangement is simply to pay homage to DeFord and to Monroe. I figured it would be good for people to hear where the tune came from and what Monroe did with/to it in his interpretation. ...What I hear in Joe's playing is not only expertise in the genre, but a deep appreciation, a love of simple songs with a no-nonsense message, usually something pertaining to positive themes and down to earth people. Those are qualities I can get behind. Mandolin Cafe: Fair to say its become Mike Compton's signature piece? Mike Compton: Oh, I don't know about that. I guess it depends on who you ask. I do like the tune quite a bit, but lord knows there's a lot of music I like out there just as well. Mandolin Cafe: Best version of Sittin' On Top of the World ever in our opinion. Tell us about the inspiration for the arrangement. Mike Compton: That was taken pretty much from the Mississippi Sheiks version straight from the record, at least initially. I prefer their slow tempo and greasy execution of the tune, not to mention the jump to the "4" chord on the second line of the verse rather than the contemporary bent of walking into it. You can see that coming a mile off. I prefer the surprise twist of the Sheik's version. Mandolin Cafe: You're known to favor Australian built mandolins and mandolas and both appear on the project. Which instruments got the call for this recording? Mike Compton: It has nothing to do with whose name is on the headstock. I used to play a very nice Randy Wood years ago, but had to give it back. Fortunately I've got another. I became acquainted with Steve Gilchrist's work in 1979 due to having to return the Wood. Gilchrist and I met around the time I bought that first F5 and have kept up with each other's work through the years since. I began using Duffs just in the last half dozen or so years. Both Duff and Gilchrist have been very helpful and generous to me in helping me acquire work in Oz and in keeping my mandolins in shape and I think they exhibit not only a great product but also have an honest work ethic. None of this is to say that I haven't had good mandolins built in the US. I've had a couple killer A model Gibsons that I wish I had back, a Kalamazoo or two, even a Kay florentine that I loved to play fiddle tunes on. The instruments used on this project are my Duff long-scale H5 mandola #14609 and my Gilchrist F5 mandolin #02536. I'm thinking I had the Gilchrist F4.5 #03565 tuned AEAE as well. Really? I favor good mandolins over not-so-good mandolins. Mandolin Cafe: Two new recordings featuring Mike Compton in the past two years. Before that, quite an extended drought. It's no secret you don't particularly relish the studio. Are we beginning to see the start of a string of recordings to appear in the future? Mike Compton: Come on you guys. None of this is the studio's fault. I just never felt like I had myself together enough, didn't have anything to say musically that merited putting out for public consumption. But having Duff corner me about doing my solo project a couple years ago was enough of a kick in the pants to show me that I didn't have to render all music up until this point insignificant to go lay down a few tracks. It gave me the incentive to listen to some of the sounds I've been hearing in my mind and give them their due. And yes, I'm looking at a couple more projects to follow this one. Mandolin Cafe: You're intimately familiar with and listen to a lot of early string band music. What recordings are grabbing your attention and providing inspiration these days? Mandolin Cafe: You've become almost a regular in Australia the past few years. When is the next tour planned for down under? Who else are you working with of late? I'm still working with the Nashville Bluegrass Band, one of my favorites. I continue to do duets with Joe Newberry and David Grier. David, Missy Raines, Shad Cobb and myself have just started a band called Helen Highwater and are having fun with that and looking forward to seeing what will work there. Plus, I've been working occasionally with Tara Nevins of Donna the Buffalo. She's always fun and it's a plugged in frolic for me. It's nice to just get loud sometimes. Mandolin Cafe: Curious who the artist was that created the marvelous artwork for the recording? Mike Compton: The fellow who painted the cover art for "Live" is Eric Young from Missouri. He came to one of the shows Joe and I did at the folk school in St. Louis (Ed. note: Folk School of St. Louis, Maplewood, Missouri). He told me that he was impressed by what he perceived as the level of communication he witnessed between Joe and me while we played and that it stuck with him even after he'd gone home. Eric said that he decided to honor the music and the impact it had upon him with the painting. Part of the theme was based upon the fact that both Joe and I had on overalls, an uncommon sight in St. Louis, so hence the rural scene. Eric said that he purposefully distorted our forms a bit to give more impact. The final addition was the plow in the middle background, it being the detail that gave him the most trouble. He said that he couldn't decide what to put there until he remembered the words in the song saying, "keep your hand on the plow" and that gave him the final image. It is, to Eric, a metaphor for living life to the fullest no matter what the adversity. Mandolin Cafe: Before we let you go, give us the dates of the Monroe Style Mandolin Camp you serve as director for at the International Bluegrass Music Museum in Owensboro, Kentucky and who you think will be on staff for 2013. Mike Compton: Thanks for asking. This year's Monroe Mandolin Camp will more than likely be on the weekend of September 13-15. It is not chiseled in stone yet, but that's likely when it will be. We will definitely have myself, Dr. Brown and Skip Gorman on board, with Mark Royal assisting. We're still working on two more instructors who will be announced in the near future. I'm listening to the CD now! Great, I've been waiting for this one. A tip of the hat to Heidi. Although I don't claim to know, it certainly appears her encouragement and help are a source of inspiration to The Man. oh nice, that mandolin + clawhammer sounds is very fun, I could listen to that all day long. I picked my copy up at the Compton, Flinner workshop in Tennessee, listen to it the whole way home, A great recording and a lot of Fun, it captures those moments in time you can only get while seeing Mike play live, Joe is also great, what a combination. I highly recommend this recording! Powerful, highly musical stuff. We need more of this kind of thing out there as an antidote to the highly processed, studio assembled, artificial sounds that dominate the airwaves these days. Real music, played by real people, on real instruments in a natural way. Can't beat it. Ha! I'm glad The Byron Bay Blues fest didn't get Mike this year because it means WE got him at the National Folk Festival instead. We'll make sure you get a bloody good reception Mike. Looking forward to seeing you in Canberra at Easter. I noticed this in the intro from Scott...I haven't seen anything about this recording. Has it not been released yet? "...a brand new David Grisman Quintet in concert at Liberty Hall in Lawrence, Kansas in the late 70s..."
Quote from coletrickle: I noticed this in the intro from Scott...I haven't seen anything about this recording. Has it not been released yet? Not a recording. Just one of those special moments etched in the memories of a lot of people that I know years later that were in that same hall that night, me included. Thanks for the clarity. I wish that was an album! I'm getting this one though! Hey! I was at that concert. If you listen carefully to Sitting on top of the World, you can pretend to hear me singing along off key in the background. What an awesome night in a wonderful little intimate church venue. I'm glad that this was recorded for posterity & released to share with everyone. 'I know whose tears' is a lovely song with a wonderful performance, and the Sitting on top of the world has definitiely changed the way I (attempt) to play it. And it's already available (a bit early) on Spotify. If I may: if you want to support these great artists, buy a copy of the CD. If you want to oppose them, listen to it on Spotify (this comment to be followed by a semi-colon, dash and end parenthesis to convey the image of a human smiley-winky face). Buy directly from the artists ! Don't feed the middle man-those guys work hard & deserve all of the money. I agree if you can, always buy and help support the artist. It is important not only for the artist, but also so that the artist can support themselves and create more music! Had a listen this morning. Fabulous. I've known Mike and his music for a long time, but didn't know Joe or his music. I listened to the sample on Mandolin Cafe and my jaw dropped. Immediately bought the music and downloaded it to my laptop for our community radio station. Played 4 cuts without prelistening to them and what a treat. Couldn't wait to get to my shop to listen to the whole album. I did listen to the whole album doing a refret on a guitar and never have I had a refret that was so much fun.. That album put me in a great mood for the rest of the day... Congratulations on a live that album that will stand the test of time... I love it.. Noting the anniversary of this interviewed published this date 2013. If that opening streaming MP3 doesn't get you going, you ain't gonna be goin'. Always enjoy noting the anniversary of this interview/wonderful musical project.